This 1973 streetscape of the 200 block of E. Main St. includes the now-demolished Jex Building, so unusual that it is included in a gallery of vanishing American landscapes at Yale University. 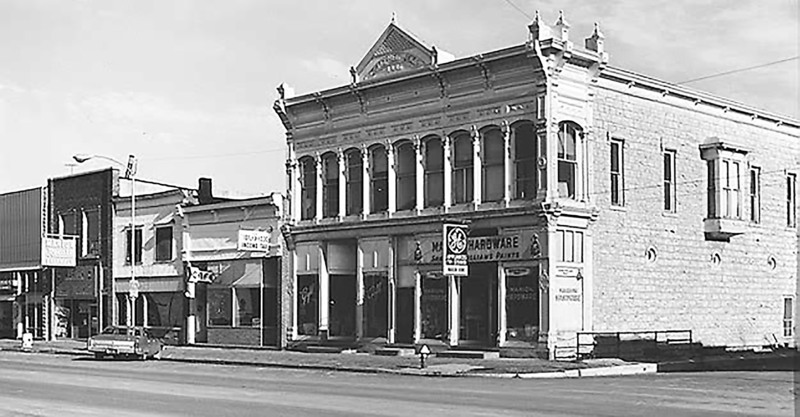 One of Marion’s most unusual structures, the 1887 Jex Building, with an ornate cast-iron facia, served as a hardware and gift store in this 1973 photo that is included in an exhibit at the Beinecke Rare Book and Manuscript Library at Yale University. The photo was taken by David Plowden of Winnetka, Illinois, who spent five decades documenting America’s vanishing landscapes and artifacts. After years of neglect, the Jex Building was deemed unsafe and demolished in the 2000s to make way for Liberty Park, on the southeast corner of Main and 2nd Sts. Stephen Jex constructed the building during a boom time that also saw construction of the Elgin Hotel and Bowron Building, which survive, and of the similarly elaborate Case Building, which was destroyed when Duckwalls variety store burned in the 1960s. Initial tenants in the Jex building, known at the time as the Jex Block, were the Steiner & Co. dry goods store and the Marion post office. The post office was a particular point of pride. The Record even got in a jab about the postmaster’s job being filled at time by political patronage. Hardcastle had become postmaster after Democrat Grover Cleveland defeated Republican James G. Blaine for president in 1884. After praising Hardcastle, Record editor E.W. Hoch, a leading Republican who went on to become governor, wrote that the community would have to tell Blaine to re-appoint Hardcastle after the next election. Cleveland did, indeed, lose his bid for re-election in 1888, but Blaine, who had been the Republican front-runner until just before the party’s convention, withdrew, and Benjamin Harrison won instead. Another unique feature of the building, not visible in this photo, was an oversized, second-story loft skylight that provided natural illumination for a photo studio. Various real estate agents, lawyers, lenders, and a millinery and dress-making shop also had offices on the second floor when the building opened. At right in the 1973 photo is a railing around a stairway leading to a lower level, which at times over the years had housed other businesses, including a barber shop. At the time of the photo, the building housed Marion Hardware and Gifts, which also sold General Electric appliances. In the building immediately to the left (east) were an H&R Block tax office just opened by Mrs. Clinton Bentz of Lincolnville and the Dine Inn Café, the former Lee’s Grill, recently purchased by Stan and Joyce May. The Dine Inn later expanded to include the entire building. The location survives as the now-closed Cindy’s Family Café. Next east, now the western portion of Lanning Pharmacy, was Peter Pan Ice Cream Store, the storefront of which soon would be taken over in an expansion by the store immediately to its east, Marion Rexall Pharmacy. At far left in the 1973 photo were Schoneman Shoes and Martin’s Barber Shop, in a building demolished when Central National Bank expanded. Martin Bina’s barber shop, the only firm from the 1973 photo still operating under the same owner, relocated across the street.